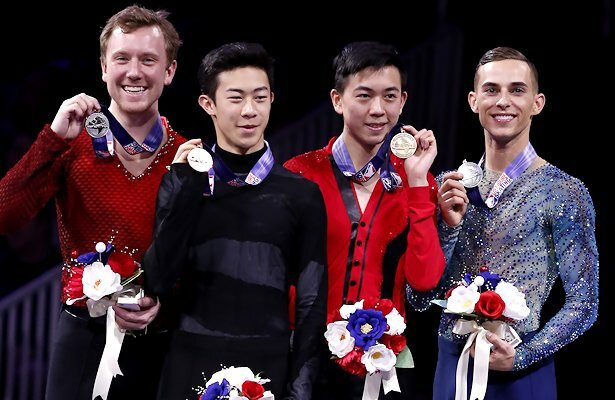 If there were one sure bet at the 2018 U.S. National Figure Skating Championships, it was that Nathan Chen would claim the men’s title, which he did on Saturday in San Jose, Calif. Ross Miner and Vincent Zhou jumped from sixth and fifth place after the short program to the podium behind the defending champion to capture the silver and bronze, respectively. Chen scored 210.78 points in the long program for a total of 315.23, just behind his totals of 212.08 and 318.47 last season and well ahead of Miner’s 274.51 and Zhou’s 273.83. The 18-year-old executed five quads in his “Mao’s Last Dancer” program, beginning with a splendid quad flip-triple toeloop and a second quad flip. He later brought out a quad toeloop-double toeloop, which was complemented with a quad toeloop and quad Salchow. A closing triple flip-double toeloop-double loop also scored in double figures for the man who has emerged as the favorite to win the gold medal at the PyeongChang Olympics. Still he could find room for improvement. Training in Los Angeles with Rafael Arutyunyan, Chen is originally from Salt Lake City and was inspired to skate when the Utah capital hosted the Olympics. Although he placed sixth at the World Championships in March, Chen has collected gold medals at Four Continents, the Rostelecom Cup, Skate America, and the Grand Prix Final in the past year. His main contenders from Japan and Russia did not skate cleanly in their national championships, which is something he believes scheduling affected. Miner skated to the music of Queen and sparked the judges with a quad Salchow. He followed with a marvelous triple Axel-double toeloop and triple Lutz-triple toeloop. It is the first U.S. medal for the Bostonian since his silver in 2013, as he was fifth the past two seasons. Zhou attempted five quads, although he under-rotated four, falling on the final one. Still, his opening quad Lutz-triple toe, along with a triple Axel-double toeloop and triple Lutz-single loop-triple flip, saved him during his “Moulin Rouge” routine. The Bay-area skater won the U.S. silver medal last season before winning the world junior championship. Zhou trains in Riverside, Calif., with Tammy Gambill, and is extremely popular in in San Jose. When he placed fourth in the Cup of China in November, he spoke fluent Mandarin to the press. It seemed Adam Rippon’s dreams were over from his first element when he under-rotated and fell on a quad Lutz. He caught himself with a triple Axel-double toeloop-double loop, along with spectacular spins and footwork, to earn 171.82 points. However, with a total score of 268.34, the skater fell from second to fourth overall. The 28-year-old won the title in 2016, but he missed last season’s Nationals due to a broken foot. Grant Hochstein finished in fifth place with 255.31 points. His routine to Phantom of the Opera was highlighted with a triple Lutz-single loop-triple Salchow along with good spins and footwork. Jason Brown struggled with his jumps to finish in sixth in the long, and slid from third to sixth place overall (253.68). At 23, Brown was the defending bronze medalist, having won in 2015, and he was coming off of finishing sixth in the Grand Prix Final. U.S. Figure Skating announced today that Chen, Rippon and Zhou would compete as part of the U.S. Olympic Figure Skating Team at the 2018 Olympic Winter Games in PyeongChang, as well as the 2018 World Championships. Brown, Max Aaron, and Miner were selected to compete at the upcoming 2018 Four Continents Championships.